A research team will climb Ojos del Salado (red flag marks the summit), the tallest active volcano in the world, to collect microbial samples from the highest lake in the world. CATAMARCA, ARGENTINA - Early in 2016, a small team will climb Ojos del Salado, the tallest active volcano in the world. Unlike most climbers, however, this group has little interest in reaching the summit. Near the end of the trek, the team will veer off the summit path to visit a site that holds something seen nowhere else on Earth at this altitude: liquid water. The group hopes to collect soil and water samples from this lake to see what microbes might be living there. 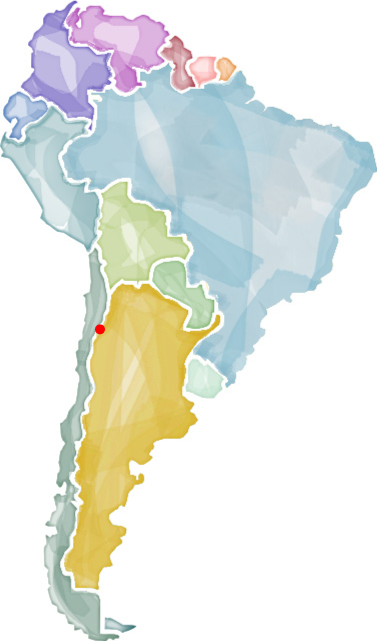 The volcano Ojos del Salado (red dot) straddles the border between Argentina and Chile. Ojos del Salado is 6,893 meters (22,615 ft.) tall at its summit, and climbing it may be as close as anyone on Earth can get to a visit to Mars. This oddly alien environment – with its aridity, low oxygen, intense cold, low ozone and extreme UV radiation – also may offer researchers their best glimpse yet of the conditions that first spawned life on Earth. National University of Cuyo professor Francisco Seufferheld and his wife, Jeannine Koninckx, will lead this expedition. Seufferheld, who also is affiliated with the University of Illinois College of Business, has climbed and organized expeditions to many Andean peaks, including to Mount Aconcagua, the highest mountain in the Americas. First as a student and later as a geographer and professor, Seufferheld has been involved in mapping and searching for many high-altitude points of interest, mostly along the Inca trail. The summit of Ojos del Salado is only about 70 meters lower than the summit of Aconcagua, the tallest mountain in South America. My husband, Jeff Hoover, and I will join the expedition, as will a medic and a photographer. A team of experienced climbers from Colorado State University will climb the volcano in tandem with our group. The Colorado team's goal is the summit, but they are sharing some logistical planning and camps with us along the way. Why climb a volcano to look in a lake? The recent evidence that liquid water still flows on Mars today has spurred new interest in the possibility that life once thrived there and may perhaps still flourish beneath the surface of that planet. It’s not a far-fetched idea. Scientists have looked for – and have found – living microbes or evidence of microbes in the most extreme environments on planet Earth, including in deep mine shafts, in a lake under the Antarctic ice sheet, in rock in the Earth’s mantle, in hot, acidic springs and around sulfuric volcano vents deep in the oceans. These studies, along with the finding that bacteria can sometimes survive journeys into space, suggest that there is no place – on Earth or elsewhere – that these tenacious creatures can’t make it work. Mars once had an atmosphere, and there is a lot of evidence that water was once abundant on its surface. Some scientists even speculate that life got its start on Mars and migrated to Earth on meteorites. No life is evident today on the surface of the dry deserts of Mars, however. And there is at least one place on Earth where nothing, not even microbes, can survive. NASA scientists reported in 2003 that the driest regions of the Atacama Desert on the Pacific coast of South America are so dry that nothing can survive there. These deserts, like those of Mars, are completely barren. 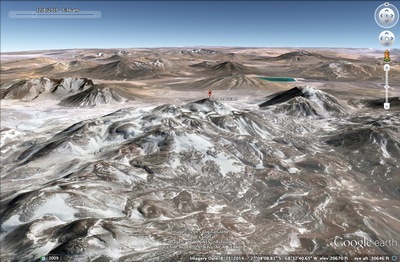 The Andean volcanoes that rise from the Atacama also are extremely dry, but they benefit from snowfall in the winter months and can sustain microbial life. Other conditions at high altitude – the low oxygen, high ozone, high salinity, high UV – also come closest to simulating conditions on Mars. So what can the microbes tell us if they are found in the salty pond at the top of the world? A lot, researchers say. I will be posting updates to this blog from the expedition as time and internet capability allow. If you are on the blog email list and would like to unsubscribe from regular updates, please email me with UNSUBSCRIBE in the subject line. If you are not on the email list and would like to be, please send me an email with SUBSCRIBE in the subject line and I'll add you to the list.